Expert advice from experienced, qualified advisers. Financial planning for expats and residents of Spain forms our core service at Finance-Spain.com. It is the centre of the wheel if you like. From this viewpoint we can assess a client, their existing financial arrangements and make recommendations having gathered substantial information about the individual, their family and what they wish to achieve in engaging our services. As part of this process we will normally meet clients face to face in a no obligation initial meeting. If the client wishes to continue we will explain our terms of business and then gather information in the form of a Fact Find as well as a Risk Profile Questionnaire. 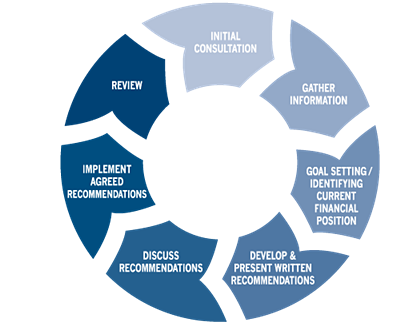 We will then produce an in depth recommendation report specific to that client and their circumstances. For this work there will be no cost nor any obligation to follow our recommendations. We offer full administrative support to our clients as part of our service. We are experts at dealing with life companies, fund houses, investment platforms and other product providers - making sure each process and transaction runs as smoothly as possible. Furthermore we have a diligent compliance department making sure that all recommendations are appropriate and follow rules and procedures set out by our regulator - The Financial Services Commission. Finance-Spain.com is a trading style of Patrick Macdonald who is an experienced, qualified international financial adviser and an appointed representative of Blacktower Financial Management (International) Ltd (BFMI). BFMI is licensed in Gibraltar by the Financial Services Commission (FSC) and is registered with both the DGS (Dirección General de Seguros) and CNMV (La Comisión Nacional del Mercado de Valores) in Spain. Blacktower Financial Management Ltd is authorised and regulated in the UK by the Financial Conduct Authority. Patrick is an Associate Member of The Chartered Institute for Securities and Investment (CISI) in the UK. Copyright 2018.